At our Annual Investiture in May we made a donation of £350 to Whizz-kidz. 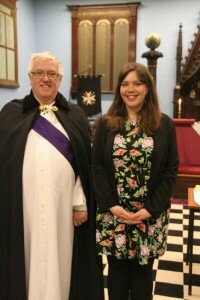 The Grand Master is pictured with Jessica Hiscocks from the charity. The Annual Investiture of the Order took place on Saturday 10 May 2014 at the Masonic Centre, Ellindon, Bretton, Peterborough, PE3 8RD. The Grand Conclave was opened in the customary manner, led by the Grand Master, Grand Prior and Grand Chancellor, with R.E. Chevalier Julian Gunnell acting as Grand Marshal before handing over to the Conclave Marshal for the final section. Michael Stephen, Anne Stephen, Gordon Wackett, Jeannie Wackett, Ian Ross, Sabina Cameron, John Farquharson, Lesley Farquharson, Rhoda Ross were all admitted as members of the Order. They were then all promoted to receive the accolade of Knight or Dame of the Order. The Conclave was closed in traditional form, and those present retired for a banquet. Some suitable and brief toasts and speeches were proposed and given. The Grand Master was presented with a quaich for the Order. It was filled with a good single malt whisky and passed to the left around the members. The Commander promised that if the Quaich were taken to the meeting of the Order, the Lion Rampant Conclave would ensure there was something to put in it. He also promised that the Lion Rampant Conclave would give the Grand Master a suitable sum for the charitable work of the Order, but we would do this in May after we have balanced our accounts for the day. A raffle raised £120.